Peerless-AVs PRG Precision Gear Projector Mount is simplifying the way image alignment is done. The patent-pending precision gear design allows exact tilt and roll image positioning by either simply turning two adjustment knobs with a Phillips screw driver, or use the tool-less option by extending the knobs to adjust by hand. Just set the precision gear to the desired position to secure it in place it will hold its position even during projector maintenance. 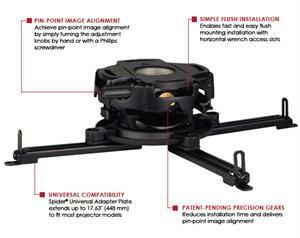 With Peerless-AV PRG Precision Gear Projector Mount, just set it and forget it. No more adjustment screws. No more micro adjustments. No more hassles.